Nancy Fraser believes that the way to interrogate a system like capitalism that infiltrates every aspect of modern life is through an interdisciplinary lens. Through her research, she examines three institutions: public power, or the state and legal authority; social reproduction, the unwaged domestic work done in families, neighborhoods, and communities that supports paid wage labor; and sustainable ecological infrastructure, in order to consider the contradictory relationships the first two institutions have to the dominant economy. Never one to work in a vacuum, Fraser says her best ideas arise in an environment of discussion and exchange. She currently writes and presents a series of essays that lay out her critique of capitalism in tandem with notions like the relationship between free wage labor and capitalism's historic dependence on slavery and colonial subjugation. 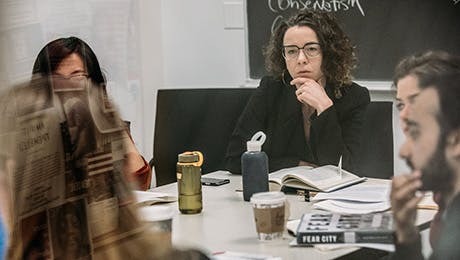 In addition, Fraser is co-authoring a book with visiting philosophy professor Rahel Jaeggi that delves into the strengths and weaknesses of each scholar's theories on capitalism. Although her ideas rely heavily on a theoretical framework, Fraser reaches beyond the academy to the public at large. She eschews the mainstream political establishment in favor of social movements that grapple with deep societal ills. A participant in and student of the movements of the 1960s, Fraser has always been interested in how movements start and, more important, how they can be sustained over a long period of time. Fraser advocates for an institutionalized structure to maintain movements' energy and momentum- a view with which many of her students disagree. This disagreement doesn't dampen the debate, however; it strengthens it by forcing Fraser and her students to ask more questions. For Fraser, NSSR's passionate and intellectual student body makes the school the only place she could see herself teaching. As a graduate student in New York City in the 1970s, she often attended seminars at NSSR and was struck by the intensity of the scholarship at the school. Years later, when she had the chance to join the faculty, Fraser did not hesitate. She prides herself on being a part of a politics department that stresses theory, conceptual debate, and intellectual critique. The environment forces students to think deeply and critically about how to conceptualize problems. Fraser, in turn, helps her students construct their own voices as writers and thinkers, to convey why a particular problem is of importance to them and how their approach differs from that of other scholars.